In the bustling Limerick City, Ireland, the Limerick City of Culture has been enacting a new initiative to breathe life into abandoned, derelict buildings and stations through out the city. Titled Draw Out – Urban Exhibitionists Initiative, this movement has already transformed a variety of locations throughout Limerick City. 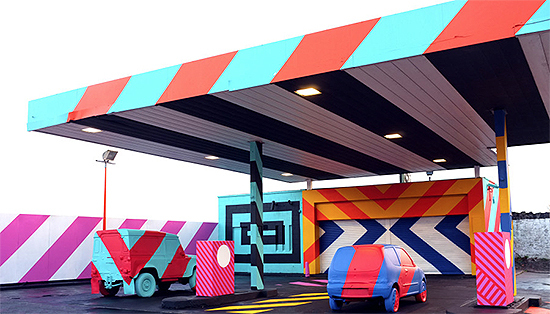 One such creation is an abandoned gas station, which Irish graffiti artist Maser has redesigned into a bright neon-colored playground! Titled “No. 27 – A Nod to Ed Ruscha”, the piece is designed with Ed Ruscha’s “26 Gas Stations” series in mind, which paid homage to the American-style gas station as a cultural icon. 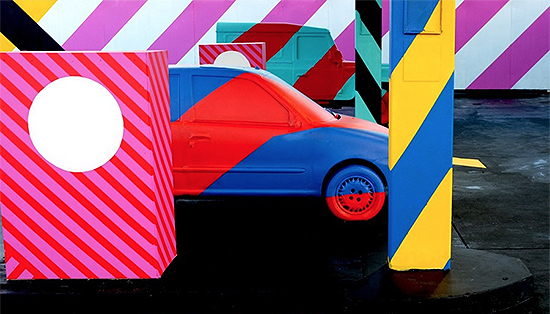 Through redesigning the derelict station, Maser used huge, colorful lines to bring an individuality to an otherwise overlooked destination. With 20 other sites scheduled to be redesigned by a variety of pop artists, it’s a refreshing way to recycle useless property into an art form, and we’re excited to see what’s next!